Who says we only live in the moment? The magic of photography takes us from an August day to a December morning. Same shot but with some pomegranates withering after their season has ended. 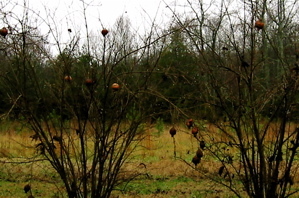 Don’t let the damp drab winter light or the rotting fruit bring you down, the birds benefit from it. OoH yeah, life goes on without regard to our pomegranates. They came from eastern Iran and southern Afghanistan region. But this tree is happy in the central Georgia morning sun. 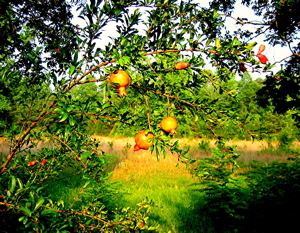 In another place called Georgia, to the east of the Black Sea, there are wild pomegranate groves outside of ancient abandoned settlements. Above we see a sample of a small grove behind a farmhouse. In Greek Mythology, Persephone was forced to stay in the underworld with Hades for 1/2 of the year (six months) because she ate six pomegranate seeds. The Ancient Egyptians were buried with pomegranates. The Babylonians believed chewing the seeds before battle made them invincible. The Qur’an (or Koran) mentions pomegranates three times (6:99, 6:141, 55:068) – twice as examples of the good things God creates, once as a fruit found in the Garden of Paradise. This group of trees came from a picnic we had years ago. We shared one pomegranate and played around spitting seeds. We were kids (that makes spitting seeds okay). Now that we are living in the future we have trees from that seed spitting episode. One can imagine the picnic blanket that these trees sprouted around. The trees make a blanket shaped outline! container completed, midnight Pacific time.